I will hold my powder dry until the end of this post. There are so many things I liked about this movie that it would be a disservice to start with the thing that irritated me the most. Instead, we’ll concentrate on the strong points at the outset and hope that my ire calms down enough to be fair to the movie. 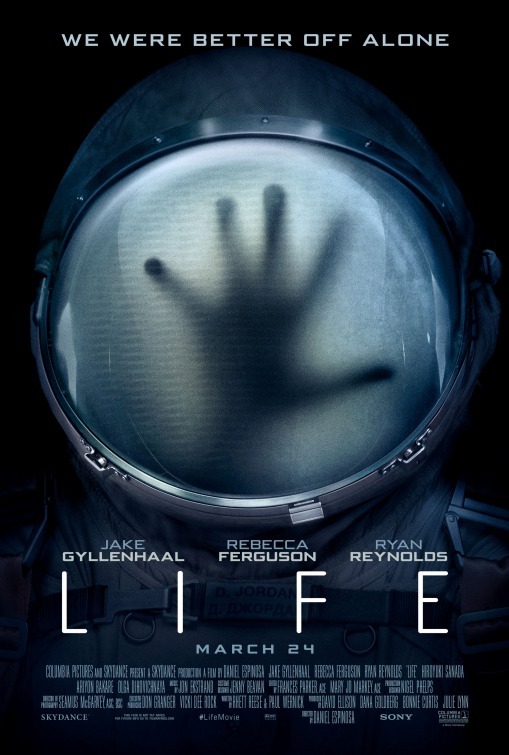 “Life” is a horror film in a science fiction atmosphere. That makes it sound derivative of “Alien”, but that’s OK because as great as “Alien” is, it is also a product of ideas that came before it, and it made a great film, so this could do the same. An International Space Station, set up to process materials from other planets, (basically Mars), receives a sample back after the delivery capsule encounters some problems on it’s way to them. A group of six scientists and engineers are ready to take possession and begin analysis in the safety of space, above the Earth. Naturally things do not go as smoothly as expected. Proof of life beyond our planet becomes an international moment of celebration, but the initial joy of the scientists becomes dread as the life form begins to develop some dangerous characteristics. As with all horror films, the group of potential victims is faced with a variety of options. 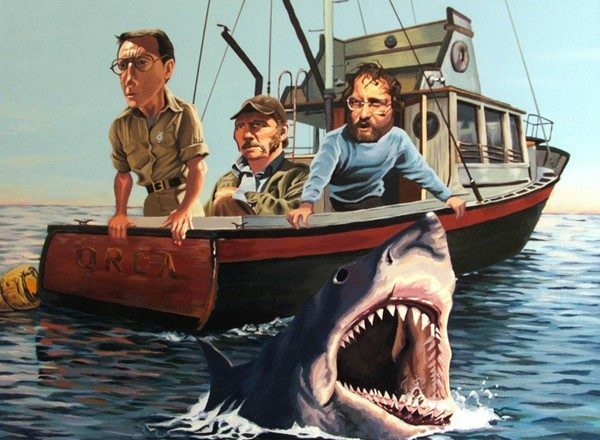 Almost all of the choices are bad and most of the actions of the crew will in retrospect seem foolish. An early mistake that supposedly can’t happen allows the life form access to a larger area of the space lab. This sequence happens so fast that it is difficult to tell exactly what happened. However, the sequence that immediately follows is the best section of the film. Astronaut Ryan Reynolds attempts to rescue his comrade from a seemingly sudden attack. Just like in “Alien” someone has to break the protocol to allow events to play out. Immediately we get a sense of the power and potential intelligence of the new life form. Just as with Alien, the use of fire is not particularly effective. The results are gruesome and frightening in a very tense five or six minute scene. It is exactly the kind of thing you hope for in a story of this type. It begins to feel like we are playing out the “Ten Little Indians” scenario in a horror film one more time. We are given glimpses of the personalities of the crew and one by one they will be killed by the monster. A few red herrings are set up and the plotline plays them out reasonably well for a while. The visual effects of the activities on the station and the movement of the creature are very disturbing and effective. The actions of stars Jake Gyllenhaal , Rebecca Ferguson, and the rest of the cast, sometimes are heroic, sometimes lucky and occasionally clever. For most of the ride we get the kinds of action and suspense that we paid our money for. Just as I thought last year’s “The Shallows” was a reasonably entertaining variation of the “Jaws” concept, I found this to be a pretty effective variant on “Alien”. That is until we get to the Ian Malcolm moment. [Potential spoilers. We wary of proceeding]. In “Jurassic Park”, the character of Ian Malcolm explains very simply that “If there is one thing the history of evolution has taught us it’s that life will not be contained. Life breaks free, it expands to new territories and crashes through barriers, painfully, maybe even dangerously, but, uh… well, there it is. …”Life” finds a way.” We might be lead to believe that this is a description of the science team, and that gives us the rooting interest that an audience will need. Unfortunately just as most of the characters make a mistake or bad choice along the way, just as we think the writers responsible for “Deadpool” and “Zombieland” are about to show that they can find a way the make “Life” work, …they choose poorly. The twist suckerpunch at the end of the film destroys most of the goodwill the film built up for me. There were a lot of other options that could have been more satisfying, but no, the film makers go for a big finish and they flop.